I've always thought making yogurt is difficult. Seen in the shops selling yogurt powder and books that comes along teaching you how to make a successful yogurt. I tell myself what a hassle, just buy from the supermarket. They're even cheaper! Than one day when I chat with a Indian colleague, she told me that their family always made home yogurt for dinner and drinks. It started me thinking of making it myself. And there goes the process of using full cream powder to mix with boiling water to make liquid milk and than cooling it to the right temperature before adding the yogurt into the mixture. This take at least an hour to prepare. 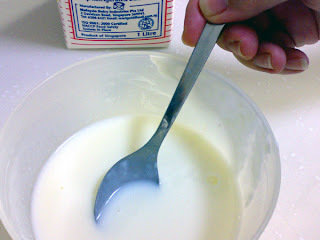 This method is only suitable to make plain yogurt. 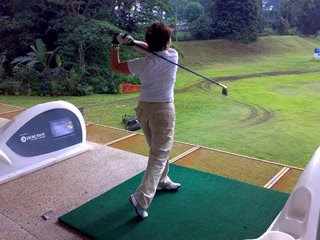 It was successful for a few times, but as time pass I just lost the interest due to the long process. Many years has past, now my mum has learnt from my aunt a simpler way to "make" yogurt. This time we can make banana, strewberry and chocolate yogurt. Please note, this method is only suitable in temperate countries only. 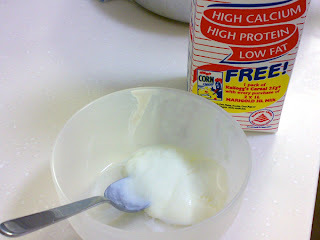 Take your favourate cold milk, pour a portion that you will like to make into yogurt. 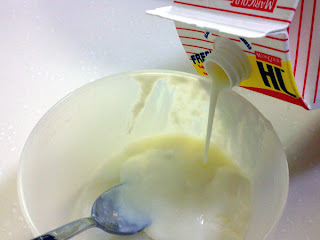 Than take two teaspoon of plain yogurt and mix them well. Cover them up on tight lit and leave them at room temperature until it turns semi solid. This takes afew hours. After which you can place them into the fridge until it's ready to be eaten. 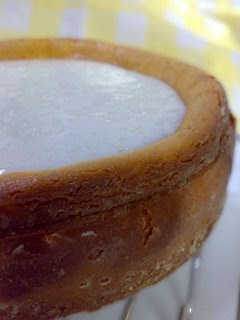 This is another Cheese Cake which I got it from a website. 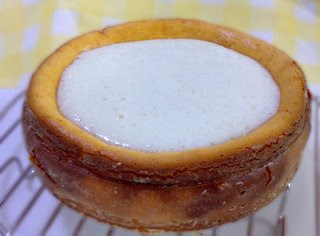 Baked New York Cheese Cake with Yogurt well. Enough to serve 8 person. Think it really taste good b'cos my sister request for the recipe. My niece asked for a second piece and my husband which doesn't eat yogurt gives a thumbs up too!